Sounds View 304 ......... "sunshine every day"
304 Oxleys Apartments, London Quay, Picton, NZ. Five-Star luxury apartment with sunny balcony overlooking Picton’s vibrant wildlife paradise. View gannets diving, seals and dolphins frolicking, boats large and small plying the bay. 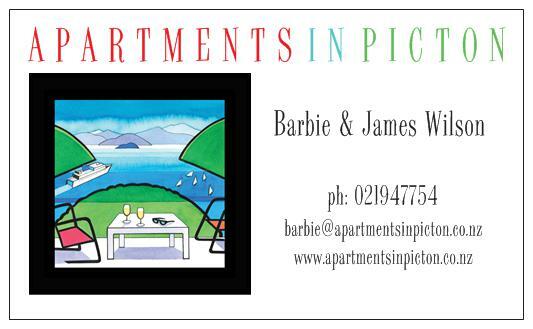 Peaceful and tranquil; central and sunny, with spectacular views of Marlborough Sounds and surrounding bush-clad hills. Spacious layout with expansive living room, large dining table and modern kitchen, free unlimited Wi-Fi, MySky TV and Blue Tooth music system. A fully functional home-like apartment with all linen and kitchen basics provided. Secure car park and lift to the door on third floor. Surrounded by cafes and shops. Only 2 minutes’ walk to land and water transport hubs, cinema, aquarium, safe children's playground, mini golf and museum. Bedroom 2 - Double bed and bathroom with bath and shower in secluded wing. Bedroom 3 - Two Single beds. Picton is a hub for nature enthusiasts, cyclists, walkers, kayakers, divers and sailers. Art, music and wine are also features of the town and region. ​Attractions include Queen Charlotte Track, and Marlborough Sounds resorts ( Lochmara Lodge, Bay of Many Coves Resort, Portage Hotel, Punga Cove Resort), Dolphin and whale watching, Nature reserve, and conservation initiatives. Less than thirty minutes from Marlborough wineries and restaurants by car or guided wine tours. An hour and half to Nelson.